Adding to the Everything-Causes-Global -Warming file comes the nuttiest idea yet! Researchers have used computer modelling to show plants actually cause global warming. The research shows surprise,surprise,that the contribution of CO2 to Global Warming is "worse than we thought". I think that alarmist keyboards have those four words on a function key for fast retrieval. Plants take carbon dioxide (CO2) out of the atmosphere to do photosynthesis, and thus help reduce the greenhouse gases warming the planet. At least, that’s how the story went before researchers from the Carnegie Institution for Science (CIS) realized that the today’s carbon dioxide levels cause the plants to behave in a way that actually contributes to global warming. Writing in the latest issue of the journal Proceedings of the National Academy of Science, the CIS scientists unveiled new research that shows increased carbon levels cause plants to retain water that otherwise would have evaporated from their leaves, entered theatmosphere and helped cool the planet. At local levels, this effect can increase the temperature to be 25 percent more than what the greenhouse effect would have done on its own. 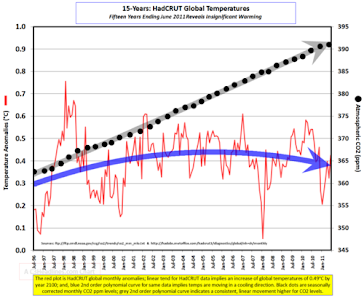 Of course we now need and have been given a new climate computer model to rectify any minute inaccuracies in the old ones. Most climate models don’t take the cooling effect of this escaped plant water into account, so the CIS researchers generated new climate models based on their understanding of this phenomenon. The new model showed that, averaged over the entire globe, the loss of released plant water accounts for 16 percent of warming of the land surface, with greenhouse effects accounting for the rest. But in some regions, such as parts of North America and eastern Asia, the effect can account for more than 25 percent of the total warming. Unfortunately, these results don’t just confirm that the contribution of CO2 to global warming is worse than scientists previously thought, but also greatly complicate any attempts to reverse the warming process. Somewhere,sometime' these loons in white coats will have to learn that not every single natural process in this world has to be related to Global Warming and some things just are! The CO2 must also stop hot soil from drying out. Very interesting, but stupid! What these CIS scientists failed to do was complete the research which would show that this retained water reduced water uptake from the soil. This maintains the overall water content in the system and that available in the soil for evaporation this cooling this part of the system. Thyis goes to show that partial results based on incomplete facts are meaningless. Plants inherently change their pore size to regulate plant growth. Thats the way God made them. Photosynthesis is an endothermic (heat absorbing) reaction = 4,573 Btu/lb CO2. They fail to mention that because of more CO2 there is also more plant growth. 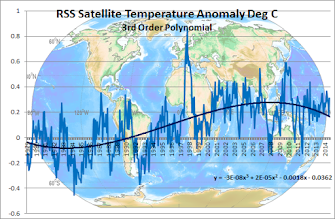 If you take the added growth into account my bet is that total cooling does not change one iota. In my previous comment the total cooling I mention refers to cooling by evaporation. Compared to the total area of water bodies on the planet, this plant evaporation is meaningless. I guess grant applications are coming for the climate science people... got to publish!!! "cause plants to retain water that otherwise would have evaporated from their leaves, entered theatmosphere and helped cool the planet"
"Ultimate Stupidity" doesn't do them justice. Water vapor is _the_ worst greenhouse gas. Less water vapor means a cooler planet, not warmer. What those guys stated is the exact opposite of what every other scientist says about water vapor. In fact the "forcing" caused by CO2 is theoretically because a little bit of warming caused by CO2 causes more water to evaporate, which in turn causes 6 times the greenhouse warming the CO2 caused. I've seen this elsewhere, the claim is that more CO2 results in fewer stomata (leaf pores) and hence less cooling by evaporation i.e., more warming. What's left our of course is that CO2 enhances growth, producing extra leaves which have more stomata. Hence there isn't any loss of evaporation or cooling. And you get the benefit of more crop production oxygen production, biomass etc. The lies and distortions from the other side are truly amazing. Just think, somewhere a university gave these nimrods a degree. Furthermore the biosphere is greening. Also since plants need to use less water with higher CO2 levels their habitat range will expand into more arid regions.